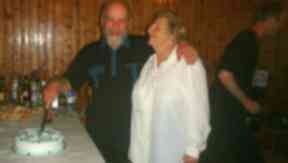 Michael Braddock, 74, has served the Orkney isle of Graemsay for over 16 years. 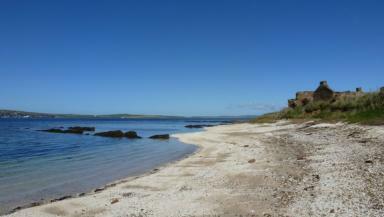 On the small Orkney island of Graemsay there are two lighthouses, 12 homes, 27 people and one postman. For 16 years, Michael Braddock has served the tiny island community, ready at the lick of a stamp to throw on his royal red satchel and deliver his round. 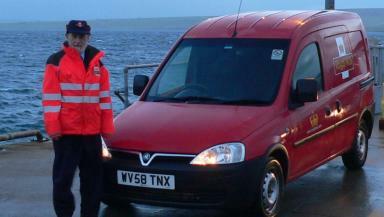 Over the years, being an island postie has meant extra responsibilities. On bad weather days, the 74-year-old has to dodge breaking waves along the pier to get his mail bags off the ferry. On really bad weather days, when the coastal winds pick up, he acts as a human barrier to protect local children on their way to school. Dressed in his overalls, the postman stands with his daughter-in-law, the post-mistress, at the edge of the pier, acting as a wind buffer to the six children trying to board the boat to the mainland. "Everybody knows everybody on Graemsay," he says cheerfully. 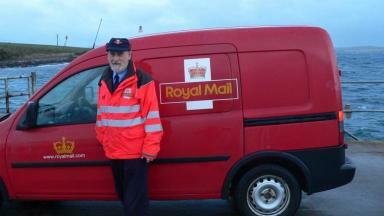 On December 15, the friendly postie is preparing for his - and the Royal Mail's - busiest day of the year. He might live on an island of barely 30 residents, but that doesn't meant things don't get a bit hectic. Around 120,000 Royal Mail postmen and women and 19,000 temporary Christmas staff across the UK will be working flat out on deliveries before the recommended last first class posting date of December 21. Sorting offices can expect on average to process around 2,800,000 letters, parcels and packets. Last year, Royal Mail nationally predicted the posting of 150 million items, which is nearly double the usual daily volume of mail. "We don't get it like they do on the mainland, but we are kept plenty busy," says postman Michael. It has been 27 years since Michael first arrived on the island with his beloved wife, Pat. Situated between the town of Stromness on the Orkney Mainland and the island of Hoy, Graemsay has no shops, school or pub. What it does have, is thousands of wildflowers, heathland and wildlife. The two lighthouses on the island, Hoy Sound High and Hoy Sound Low, are "leading lights" that were used to guide the herring fleet safely through the difficult waters to harbour in Stromness. Both lights are automatic now, but for many years lighthouse keepers lived in the houses beneath the lights. Today, Michael and Pat live in one of the cottages instead, as no-less important members of the small community which thrives there. "I try to keep an eye on any folk who live alone and might be in need of help," says Michael. "If folk want to know who is on the island at any one time they tend to ask me." With such a close-knit community, it is customary to invite the entire island to a birthday party, and partake in summer dances, gatherings and regular island quizzes. Michael's main duty, however, is still to deliver his parcels come what may - and on island, that could mean ice on one-way roads, sea storms and good old Scottish mud. "There was one little old lady who lived on the side of a very tall hill," he says, already chuckling at the memory. "I gave up trying to get the van to the top, so I would park across the road and walk up the hill." With slippery slabs and mud left over from strong bouts of rain, Michael found it very difficult to reach the top to deliver the mail. However, after the harrowing ascent, his efforts were rewarded in the simplest of ways. "She would be waiting at the top with a cup of coffee for me when I eventually made it," he says. "It was really quite lovely." Getting the mail from the ferry in stormy weather whilst dodging waves breaking over the pier is also a difficult challenge. As can the gales which lead to waves breaking over the road, which Michael calls " a nightmare". "Fortunately the Royal Mail supplied me with a boat suit which keeps me both warm and dry though I do occasionally get caught out when I think it will not be too bad at the pier," he says. When you have as much experience of island postal life as Michael does, though, there are not many challenges you cannot overcome. For example, a postcard arrived in the mail room one morning, addressed to a lady who had not long moved to the island: "Sian, a caravan, somewhere on Graemsay." Despite the lack of postcode, Michael managed to deliver the postcard to Sian, who thereafter became one of his very good friends. Michael worked as a radio communications engineer before taking over the island's post office, which is only open three days per week. And while he is looking forward to delivering gifts to the community he knows so well, he also has a few fond memories of his own Christmas deliveries that landed into his own lap as a boy. There weren't many presents being delivered for Christmas in the 1940s with war rationing, but Michael remembers a small bundle of colourful sweeties for him and his sister June. Then there was the very special gift when he was eight years old, a Crystal set wireless radio receiver. "It remains my favourite gift," he says. In the run-up to Christmas, Michael has his postal van full of gifts and cards for his neighbours, and says he is just as excited for this 16th Christmas delivery round as he was when he first put on his postal jacket. That said, he still has a Christmas plea to issue to those hoping to get their gifts sent out in time. "I know the lengths everyone, everywhere in Royal Mail goes to during the festive season to help ensure gifts and cards are delivered on time at Christmas," he says. "Please help Royal Mail at its busiest time by posting your cards and gifts early and using the postcode."